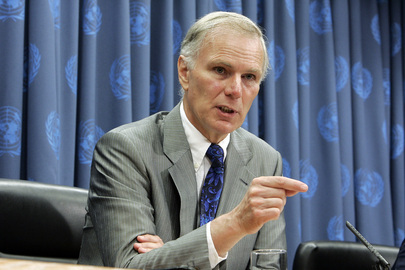 UNITED NATIONS, October 27 -- As Sri Lanka announces another internal investigation of the war crimes charges against it, at the UN on Tuesday the Special Rapporteur on executions Philip Alston told the Press he has "begun to commission some analyses of that video tape" depicting Sri Lankan soldiers shooting bound and naked prisoners. Video here, from Minute 6:56. 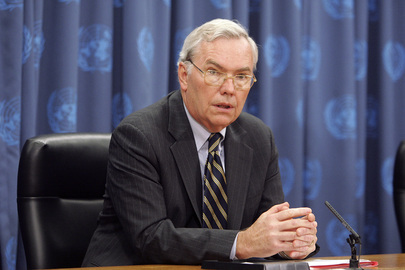 Inner City Press asked Alston about the reports that people seeking to surrender in May, waving white flags after in some cases speaking with UN officials, were shot and killed, reportedly on orders from the highest ranks of the Sri Lanka military. Video here, from Minute 11:13. "Let's have an independent inquiry," Alston said, noting that past "investigations" by the government were not independent. He used as his example that two Sri Lankan military figures were charged with investigating the execution video. The government of Sri Lanka cannot be proud of its track record, Alston said. Before commissioning his own analysis of the video, Alston said he "would have liked the Office of the High Commissioner for Human Rights" Navi Pillay to have undertaken an investigation, as was done for example by Justice Richard Goldstone of the conflict in Gaza this year. Inner City Press asked Alston about the countries on the Human Rights Council which have rebuffed his requests to visit, including both China and Russia, which blocked Security Council consideration of the conflict in Sri Lanka this Spring. Alston said "there has to be a limit," presumably to what members of the Human Rights Council can do. But for now, there are no limits. Alston's mandate expires in August 2010 and will no be renewed. Two other Rapporteurs, on Internally Displaced People and freedom of religion, also took questions about Sri Lanka on Tuesday. Inner City Press asked IDP expert Walter Kaelin about a headline in Sri Lanka, "UN envoy pleased with progress," in the Sunday Observer of September 27. Kaelin said he'd never spoken with that newspaper, and went on to criticize the conditions in the Manik Farms camps. He said people were being moved out. Inner City Press asked if the so called transit camps also restrict movement. He said that they did, and that this did not comply with international humanitarian law. Video here. But the UN keeps funding it, apparently. 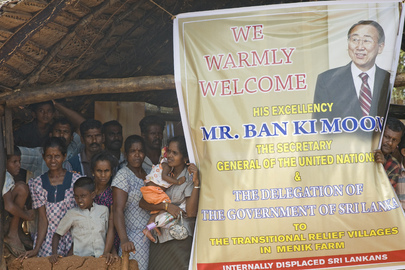 Inner City Press asked about IDPs' right to return to their homes, and not be displaced, as some say is planned in northern Sri Lanka east of A9, by members of other ethnic grounds. While Kaelin said there is a right to return which the government of Sri Lanka has not disputed, he acknowledged that he is not able to closely monitor what happens on the ground. And therein lies the problem. Inner City Press asked the Rapporteur on freedom of religion or belief Asma Jahangir about this same issue, Sinhalese versus Tamils, the Buddhist triumphalism some see in Sri Lanka. She acknowledged she'd heard of it, ascribing it to political fights "long ago." Video here. But these fights continue. The UN system, even its special rapporteurs, may appear out of touch. Watch this site. UNITED NATIONS, October 24 -- While the UN claims to be much concerned about civilians in and from Sri Lanka, a week of questioning five separate officials at UN headquarters tells a different story. When Inner City Press asked the UN's special rapporteur on torture Manfred Nowak if he'd looked into the case of the two UN system staff members disappeared and they say tortured by the Sri Lankan government, he said no. Video here. 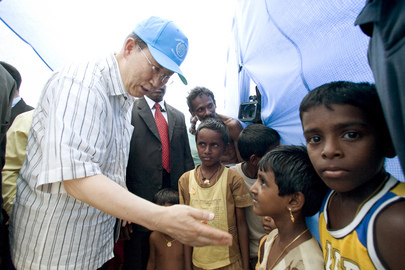 Inner City Press has asked two of the spokespeople for Secretary General Ban Ki-moon what is the UN system doing about the Sri Lankan asylum seekers on hunger strike in Indonesia, blocked from Australia, and now off Canada. Each time an answer has been promised, but none has been provided. With UN High Commissioner for Human Rights Navi Pillay on a panel about human trafficking, Inner City Press asked what the UN made of claims that these Tamil asylum seekers were somehow engaged in traffic. Ms. Pillay did not answer, leaving another panelist to answer, in essence, not necessarily. Video here. 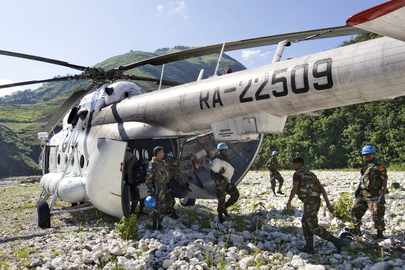 Meanwhile, despite most recently the US State Department report detailing what elsewhere are called war crimes, the UN Department of Peacekeeping Operations is contracting for 198 more Sri Lankan soldiers to patrol in Haiti. Inner City Press asked what safeguards are in place to determine if any of the supposed peacekeepers were themselves engaged in crimes of war. UN associate spokesman Farhan Haq replied, "DPKO relies upon the troop-contributing countries to vet all of their soldiers to make sure that their records are clean regarding any sort of involvement in violations." This position was repeated by a representative of UN Police. Video here. At a Friday press conference promoting a concert for Peacekeeping, sponsored by Chinese businessmen who contracted for photographs with Ban Ki-moon, a pro-UN director spoke glowingly of the Sri Lankan troops in Haiti. 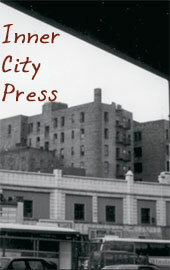 Inner City Press noted that a full contingent was sent home amid charges of sexual abuse and exploitation. They talked about that, the director answered, they said there were some bad apples. Video here. Meanwhile in Toronto, Tamils have protested in front of UNICEF. Is it any wonder? Inner City Press: I’ve seen that Sri Lanka is sending a contingent of 198 peacekeepers to Haiti on 8 November, and I’m wondering, in light of the Office of the Human Rights finding, this United States State Department finding, looking into war crimes, and a European Union thing on [inaudible], there’s a lot of findings -- what is DPKO [the Department of Peacekeeping Operations] going to do in terms of making sure that the soldiers sent didn’t participate in what now a number of people say credibly may be war crimes? What safeguards are in place? Associate Spokesperson Haq: As you know, as a standard rule, DPKO relies upon the troop-contributing countries to vet all of their soldiers to make sure that their records are clean regarding any sort of involvement in violations. UNITED NATIONS, October 20 -- The Sri Lankan government is already delaying the visit of the UN's Patrick Cammaert, announced a mere week ago as starting in early November. In response to questions from Inner City Press last week, UN Children and Armed Conflict expert Radhika Coomaraswamy disclosed for the first time that the government had agreed to an early November visit by Mr. Cammaert, formerly with the UN Peacekeeping Mission in the Congo. Yesterday, Inner City Press reported that sources told it the visit would be delayed. Tuesday it was authoritatively and multiply confirmed to Inner City Press, that the government has pushed the date back to November 23 -- a time which currently doesn't work for Mr. Cammaert. The government's pretext for the delay is that it is moving some of the youths from one camp to another. These moves are of course within the control of the government, and it is not at all clear that the government didn't know about its move last week. To some, the postponement seems a heavy handed reaction to Ms. Coomaraswamy having said anything publicly about Cammaert's trip. Then again, Inner City Press' sources for yesterday's item now say that the government is dangling the possibility of reinstating Cammaert. It is called trying to control the UN's speech: quite successfully, of late. Footnote: following yesterday's piece which questioned why Ban Ki-moon's Spokesperson did not last week in lengthy noon briefing read-outs mention anything about Ban's meeting with the Sri Lankan minister, the Spokesperson points to the listing of a photo-op between the two. Inner City Press, which had seen that before publishing yesterday's not inconsistent piece, has asked for a copy of Ban's Daily Schedule for October 12, for an on the record answer as to why the Spokesperson's Office does not archive Ban's daily schedule and an explanation of how it is decided which of the S-G's meetings and calls are presented in the initial parts of noon briefings or in writing, and which are only summarized if someone knows to ask. Watch this site. At UN, Delayed Read-out of Ban's Meeting with Sri Lankan Minister, NGO Deadline for Internment, Cammaert Postponed? UNITED NATIONS, October 19 -- UN Secretary General Ban Ki-moon met last week with Sri Lanka's Minister of Disaster Management and Human Rights Mahinda Samarasinghe. Inner City Press learned of the meeting on October 16, and on October 19 asked Ban's spokesperson Michele Montas to confirm and summarize the meeting, and why it had seemingly not been on Ban's public schedule. Video here, from Minute 19:56. Ms. Montas replied that her Office had been holding a "read out" of the meeting for "whoever wanted to find out about it." Among UN correspondents, Inner City Press would be defined as interested in this issue, as "wanting to find out about it," and yet was never told of the meeting. Nor were wire service reporters who like Inner City Press accompanied Ban on his trip to Sri Lanka in May. So who were these interested people who were told about the meeting? The UN offers, unprompted, press releases and read-outs at its daily news briefing. But during the October 13 briefing no mention was made of Sri Lanka, see transcript here. Why was no read-out given of the meeting with a minister of Sri Lanka, where Ban is uncomfortably implicated? Later in the October 19 briefing, a staffer brought in to Ms. Montas a piece of paper and she read out loud that the October 12 meeting was a continuation of discussions held during the General Debate and by Ban's Political Affairs chief Lynn Pascoe, about political, humanitarian and human rights commitments, particularly resettlement and freedom of movement. Video here, from Minute 25:40; see transcript here and below. 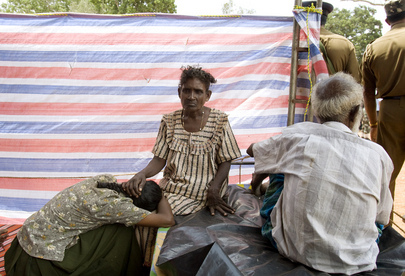 On resettlement and freedom of movement, Inner City Press has separately been told that non governmental organizations working in Sri Lanka are setting a December 31 deadline, that they cannot in good conscience continue propping up internment camps after that date, but only "open" camps, a definition of which they say does not include camps like the transit camps near Jaffna from which IDPs are given day passes but must return at night. Given what many view as the UN's laxity and lack of transparency to date, perhaps only the NGOs are willing to actually push for an end to the internment. We'll see. After the belated October 19 read-out, Inner City Press said it had not seen the meeting on Ban's schedule. It was on the 12th, Ms. Montas said. It was there. Video here, from Minute 26:16. Neither Inner City Press nor the other reporters it later consulted ever saw the meeting listed on Ban's daily schedule. This document, which the UN doesn't publicly archive, lists Ban's meetings with ministers and even NGOs. While Ms. Montas said it was on the schedule on October 12, none of the reporters consulted by Inner City Press has seen it. Perhaps it was put in some late revision of the schedule, which was then never seen again? Could this be part of an emerging pattern? Ironically, the UN's Department of Political Affairs has since bragged that Ban was "tough" in the meeting, telling Samarasinghe that Sri Lanka has so tarnished its reputation that even he is finding it hard to defend them anymore. But if Ban is supposedly talking tough, why keep the meeting secret? Inner City Press asked Ban's Spokesperson's Office, again on October 19, if there is yet any UN response to the Sri Lankan asylum seekers diverted from Australia to the coast of Indonesia, and now other arriving on the shores of Canada. Again there was no answer. Video here, from Minute 20:26. The questions will continue. Footnote: Inner City Press is also told that the visit to Sri Lanka for the UN of Patrick Cammaert, which UN children and armed conflict expert Radhika Coomaraswamy disclosed in response to Inner City Press' questions last week, now faces postponement by Sri Lanka's government. Watch this site. Spokesperson Montas: I’m sure the UNHCR is aware of them. I don’t have anything specific. I can get more information for you on what is happening to them. But of course, we’re aware. Spokesperson: Yes, he did, and we had a readout for whoever wanted to find out about it. Spokesperson: Yes, it was on his schedule. Inner City Press: What day did they meet and what was the meeting about? Spokesperson: This was last week. I don’t have the details right now. But of course I can give you the details. We had a readout on it. Spokesperson: ...about what you were asking [earlier], on the Secretary-General’s meeting with the Sri Lankan Minister of Disaster Management and Human Rights, what we had last week was: This is a continuation of discussions the Secretary-General held on the margins of the general debate and those pursued by Mr. [B. Lynn] Pascoe during his visit to Sri Lanka -- on the need to accelerate the Government’s efforts in addressing post-conflict political, humanitarian and human rights challenges, in particular the urgent issue of resettlement of IDPs and freedom of movement of IDPs. So that’s what it was about. That readout was available to you last week. Spokesperson: Because it was on the twelth [sic]. It was there. UNITED NATIONS, October 14 -- The UN will send Canadian Major General Patrick Cammaert to Sri Lanka from November 8 to 13, and "internally displaced children will be one of the issues raised," UN children and armed conflict official Radhika Coomaraswamy told the Press on Wednesday. Inner City Press had asked Ms. Coomaraswamy about her reported meeting with Sri Lanka's Prime Minister during the UN General Debate in late September. Video here, from Minute 42:26. Ms. Coomaraswamy replied that she "met the Prime Minister more socially," but had officially met with the Foreign Minister and Secretary Minister of Defense (apparently referring to presidential brother Gotabhaya Rajapaksa). She said that the rights of IDP children were one of the issue raised. Inner City Press asked if she thought that the condition of IDP children in the Menik Farm camps in Vanni and elsewhere complied with the "Rights and guarantees for internally displaced children" which is Annex I to her Office's report to the UN General Assembly. Ms. Coomaraswamy replied that on "freedom of movement" and other issues, she believes the camps are "in violation of principles." She called Sri Lanka's response "draconic" or draconian. 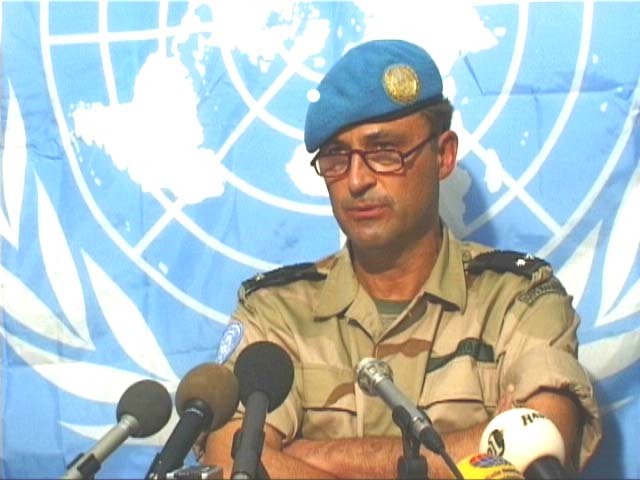 Inner City Press has previously interviewed Cammaert, who used to serve a UN military commander in the Democratic Republic of the Congo. He told Inner City Press it was an outrage that the UN stands by while indicted war criminal Jean Bosco Ntaganda walks freely around Goma in North Kivu, and has a role with the Congolese Army which the UN assists. What outrages while Cammaert witness, and have the courage to speak about, in Sri Lanka and after he comes back? Meanwhile, Sri Lanka's Ambassador to the UN Palitha Kohona was to be found down in the basement of the UN, where Sri Lanka was sponsoring a lunch time session on desalinization. Kohona appeared recently on BBC's Hard Talk program, and said that no investigation of war crimes in Sri Lanka is needed, because people just want to move forward. Which, some noted, is among the defenses being offered in the Security Council today, and in Geneva tomorrow, by Israel, for its acts in Gaza earlier this year. Click here for that story. Footnote: more seriously, there is a boat en route to Australia, now in Indonesian waters, full of asylum seekers from Sri Lanka. The way the ship and refugees are being treated does not seem to comply with international law. And where is the UN High Commissioner for Refugees? UNITED NATIONS, October 6 -- As deadly rains and storms sweep through Asia, Inner City Press on Tuesday asked top UN humanitarian John Holmes what is being done about the UN funded internment camps in Northern Sri Lanka. Video here, from Minute 22:29. Holmes replied, "especially about Manik Farm," that beyond digging drainage ditches, the plea is to "get people out," whether to their homes or to host families or even to "transit camps... as long as they are open." Video here, from Minute 24:36. The last part of Holmes answer referred to the trend of even those who are moved out of Manik Farms simply being taken to other camps, further out of the spotlight. While the government brags that in some cases, people are given "day passes" to go out of these transit camps, this would tend to show that even the government acknowledges that such people have been "screened" and are not a threat. Why not just release them, then? Some allege that the continued detentions, and also the move-arounds, are not unrelated to the elections. There's been a lot of talk about irregularities in Afghanistan, but not yet on Sri Lanka. Watch this site. Footnote: When Holmes comes to speak to the UN press corps, he has jokingly said he knows the Press will ask him about Sri Lanka. But on Tuesday when Inner City Press began to ask about the Manik Farm camps -- after other series of questions were allowed about Yemen and Pakistan -- the moderator tried to cut Inner City Press off. Video here, from Minute 22:27. UNITED NATIONS, September 29 -- In the wake of the Sri Lankan Army shooting at least two children on the margins of the Manik Farm "Internally Displaced Persons" camp in Vavuniya, Inner City Press on Tuesday asked UN Secretary-General Ban Ki-moon if, in his September 28 meeting with three Sri Lankan ministers, he sought or gained any commitment for non-use of lethal weapons on unarmed IDPs. Video here, from Minute 32:40. Mr. Ban proffered a more than 150 word answer, but did not mention any such commitment, even seeking one. He rattled off "three points" -- in essence, resettlement, reconciliation and accountability -- and said "they committed that they will do as we have agreed. But we have to have a close watch and monitor this process." But will they keep shooting unarmed civilians, including children? 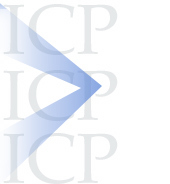 Speaking of war crimes, Inner City Press has continued to inquire into the reason for the delay in the U.S. Department of State's report on war crimes in Sri Lanka, which was due in Congress on September 21. 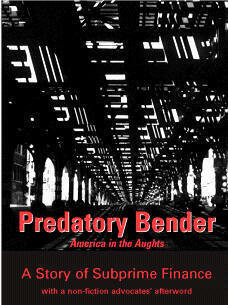 On September 29, a U.S. official on background told Inner City Press, "We are still working on the report. Congress has extended the submission date. We expect to submit the report to Congress in mid-October." This would tend to rebut reports Tuesday in the Sri Lankan press that the report is delayed "indefinitely," with assistance to the Rajapaksa administration from Israel, citing "the real assets of the Sri Lankan Air Force driving Eelam War 1V were the new Spy planes. Several Cessna 421 , Golden Eagle and two ‘Beechcraft’ super King crafts were bought from the United States for maritime and ground surveillance . Close ground surveillance was carried out by Israeli IAI searcher MK 11 and EMIT Blue Horizon 2 unmanned aerial vehicles." While the arming may be true, the full disarming of the report does not appear to be. Just after Mr. Ban's press conference, Inner City Press observed what seemed to be U.S. Assistant Secretary of State for South and Central Asian Affairs Robert Blake entering the elevators on the UN's second floor. Later in the day, Mr. Blake graciously confirmed to Inner City Press that he was at UN headquarters, holding meetings on the margins of the General Assembly and Tuesday meeting with UN colleagues on the countries in his area of responsibility -- which includes Sri Lanka. We hope to have more on this. Inner City Press: [On the] children shot in Sri Lanka, did you get a commitment from the Government not to shoot unarmed civilians who leave the camp? S-G Ban: Now, on Sri Lanka, yesterday we had an extensive discussion with the Prime Minister. And the Foreign Minister and Defense Secretary were also present in the meeting. They were the key people in managing this situation. I made three points clearly again, which I did during my visit, and which was repeated and urged again during Mr. [B. Lynn] Pascoe's visit earlier this month. First, that all IDPs should be resettled, as they had promised, by the end of January. There should be extra measures taken, particularly during this monsoon season, because their suffering will be much, much more serious during this wet season. They should immediately begin to reach out to minority ethnic groups, including Tamils. Then, I emphasized the importance of instituting immediately this judiciary accountability process for violations of international humanitarian law and international human rights law. Those were three points, and they committed that they will do as we have agreed. But we have to have a close watch and monitor this process. So was there any "commitment from the Government not to shoot unarmed civilians who leave the camp?" Apparently not.